Patented locking system prevents lateral movements on shafts or spindles. Now you can lock any spool or similar object in-place quickly and easily, preventing it from sliding on the shaft or spindle. Rugged, all-metal device slips over the shaft and automatically locks wherever you leave it. That's all there is to it - no tools required, there's nothing to set. 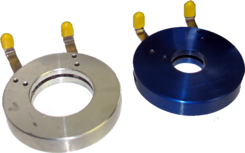 When used in conjunction with a drive plate, Quick-Locks also facilitates rapid spool removal. Stocked in the following standard shaft sizes: 3/8", 1/2", 5/8", 3/4", 7/8", 1", 1-1/8", 1-1/4", 1-3/8", 1-1/2", 1-9/16", 1-3/4", 2" diameter. A: (Shaft Diameter) 3/8" to 7/8"
C: (Minimum Clearance Radius) 2 1/4"
A: (Shaft Diameter) 1" to 1 1/2"
B: (Body O.D.) 3 1/4"
C: (Minimum Clearance Radius) 2 1/2"
Original developed for use on Progressive Spooling and Winding Machines, our Quick-Locks have applications in virtually every manufacturing environment where reels, rolls, spools, or other center-driven objects must be secured in position on a shaft or spindle. In most applications, our Quick-Locks pay for themselves in less than 30 days by saving 5 minutes/day. The more time you save, the more money you save! BE SURE TO SPECIFY SHAFT DIAMETER WHEN ORDERING. If ordering more than one diameter, make a separate line to specify the quantity of each size. GUARANTEE: our Quick-Locks are guaranteed against defects in workmanship and materials or you may return it within 10 days.